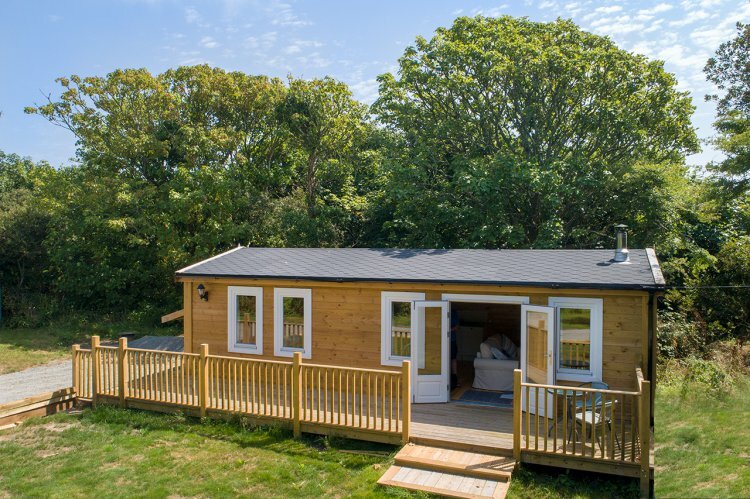 The Cabin is a newly built and furnished timber lodge set in its own private plot just over a mile from Coverack, on the beautiful Lizard Peninsula. There’s a lawn and decked area to the front which is perfect for catching the sun throughout the day, encircled by trees which add to the natural feel of this relaxing spot, perfect for retreating to after a busy day enjoying the sights, sounds and sea air in this beautiful part of Cornwall. 'Early Bird' discounts available, please see Special Offers tab below for applicable weeks. Short Breaks also considered at The Cabin, please enquire for details. Surrounded by countryside with walking available right from your door, there are winding country lanes, bridleways and public footpaths criss crossing the whole peninsula. You can also head for the South West Coast Path and walk for miles with stunning scenery at any time of year. It’s easy to reach the coast and explore the little beaches dotted along the way. St Keverne with its interesting church, pubs, shops and restaurant is just three miles away. Although set in the countryside you are also within easy reach of the beaches and historic fishing harbours of the Lizard Peninsula and Helford River. Coverack with its sandy beach is just over a mile away whilst Cadgwith Cove and the furthest southerly point at Lizard Village are a short 20 minute drive away. Other popular places for day trips such as Falmouth, Porthleven and Penzance are all easily reachable in less than an hour. Entered from the private parking across the decking and into the living area. Greeted by the timber walls and floors, there's a cosy living room with woodburner, TV, double sofa bed, comfy chair and double doors out to the decking and garden. The kitchen is well-sized for the cabin and packs in lots of functionality, equipped with a dishwasher, electric oven and hob with extractor over, fridge with freezer compartment, kettle and toaster. There's a separate area for dining with a table, two chairs and a salvaged pub bench. The bedroom has a real cosy feel with the timber walls but complete with a plush carpet underfoot, it's got a double bed, large chest of drawers and bedside lamps. A spacious shower room completes The Cabin, fitted with shower enclosure, handbasin, loo and heated towel rail. Outside is the raised decked area with a table and chairs, a lawn and gravel driveway parking to the side. The owners and their friendly dog live in their own cabin next door, separated by a hedge and gated driveway. The woodburner is the main heating source for The Cabin which is very effective at providing ample warmth, the structure is also double lined which helps keep it warm too, there are additional electric heaters if required. Rental includes, towels, bed linen, utilities and starter logs supplied with more available at cost. One well behaved dog is welcome by payment of £25 per week but please be aware that dogs are not to be left unattended at anytime. Property specific pet notes: Dogs must not to be left unattended at any time.